Who were these mysterious beings? Did they evolve separately on Earth?What caused them to have such drastic differences from ordinary humans? The desert peninsula of Paracas is located on the southern coast of one of South America’s most enigmatic countries: Peru. It is there, in this barren landscape where Peruvian archaeologist Julio Tello made one of the most mysterious discoveries in 1928. During excavations, Tello uncovered a complex and sophisticated graveyard under the harsh soil of the Paracas desert. In the enigmatic tombs, Tello discovered a set of controversial human remains that would forever change how we look at our ancestor and our origins. The bodies in the tombs had some of the largest elongated skulls ever discovered on the planet, called the Paracas skulls. The Peruvian archaeologist discovered over 300 mysterious skulls which are believed to be at least around 3000 years old. As if the shape of the skulls was not mysterious enough, a recent DNA analysis performed on some of the skulls presented some of the most enigmatic and incredible results that challenge everything we know about the origin and human evolutionary tree. While several cultures around the globe practices skull deformation (elongation), the techniques used were different, meaning the results were also not the same. There are certain South American tribes that used to ‘bind infants skulls’ in order to change their shape, resulting into a drastically elongated cranial shape that resembled anything but ordinary humans. By applying constant pressure over a long period of time with the use of pieces of mood, the ancient tribes would achieve a cranial deformation which can also be found in ancient cultures from Africa. However, while this type of cranial deformation changed the shape of the skull, it did not alter the size, weight or cranial volume, all of which are characteristic traits of regular human skulls. This is where the details about the Paracas skulls gets interesting. The Paracas skulls are anything but ordinary. The cranium of the Paracas skulls is are least 25 % larger and up to 60% heavier than the skulls of regular human beings. Researchers firmly believe that these traits could not have been achieved through head bindings as some scientists suggest. Not only are they different in weight, the Paracas skulls are also structurally different and only have one parietal plate while ordinary humans have two. 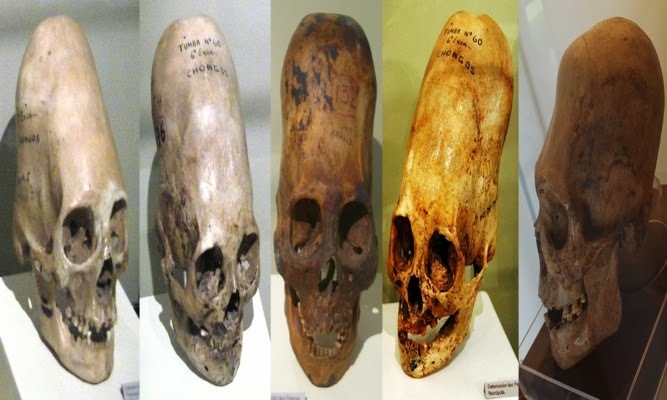 These strange characteristics have further deepened the decade-old mystery surrounding the Paracas skulls and researchers still have no idea what they were in the past. 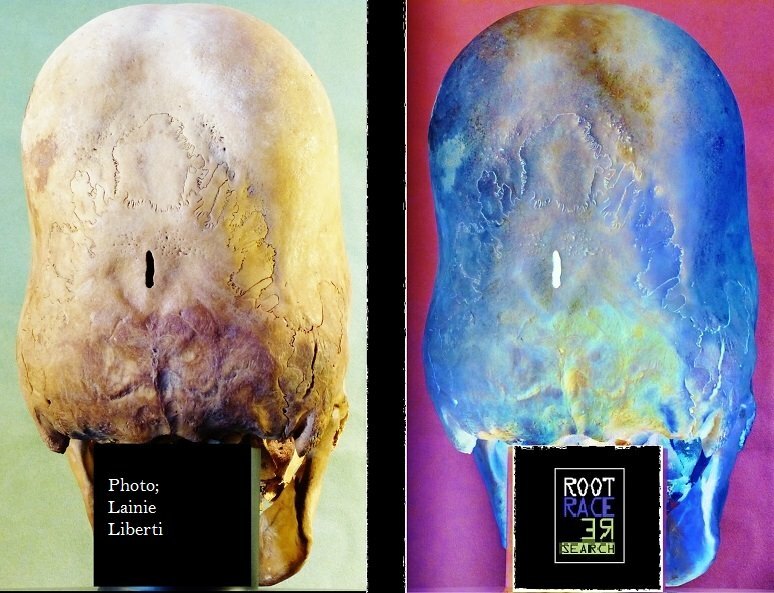 The director of the Paracas Museum of History sent five samples of the Paracas skulls to undergo genetic testing, and the results were mesmerizing. The samples which consisted of hair, skin teeth and some fragments of cranial bones gave incredible details that have fueled the mystery surrounding these anomalous skulls. The genetic laboratory to where the samples were sent was not informed of the origin of the skulls in order to avoid ‘influenced results’. Interestingly, the mitochondrial DNA, which is inherited from the mother, showed mutations that were unknown to any man, primate or animal found on planet Earth. The mutations present in the samples of the Paracas skulls suggest that researchers were dealing with a completely new ‘human-like being’, very different from Homo sapiens, Neanderthals or Denisovans. It had mtDNA (mitochondrial DNA) with mutations unknown in any human, primate, or animal known so far. But a few fragments I was able to sequence from this sample indicate that if these mutations will hold we are dealing with a new human-like creature, very distant from Homo sapiens, Neanderthals, and Denisovans. According to reports, the individuals from the Paracas skulls were so biologically different that it would have been impossible from humans and them to ‘interbreed’. “I am not sure it will even fit into the known evolutionary tree,” the geneticist wrote. Who were these mysterious beings? Did they evolve separately on Earth? What caused them to have such drastic differences from ordinary humans? And is it possible that these beings are actually not from Earth? All of these possibilities are theories that cannot be overruled given the current testing. The only thing that we know so far is that there are many things out there that go far beyond the understanding of researchers, historians, and scientists. It is possible that after all, the question to whether we are alone in the universe can be answered thanks to the Paracas skulls.